Detailed information on dyslexia related laws at the state level is available in our Parent Guide. Information provided on this page is not legal advice. If you require legal council you should seek out a qualified, licensed attorney familiar with disability and special education law. Current special education law in the United States provides parents of dyslexic children with a lot of tools to help your child get the best education possible. Unfortunately, the law can be confusing and difficult to understand and you probably don't have the time to learn every section and clause. So what to do? Start with the basics. Below is an overview of the three most important special education laws that dyslexic children can benefit from. And while this information can't replace a good lawyer, we hope you will find it a great starting place for learning your rights under the law - all from the dyslexic perspective. 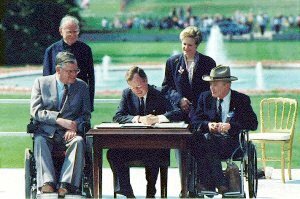 A civil rights law that prohibits discrimination on the basis of disability in any program or activity that receives federal financial assistance. A civil rights law that prohibits discrimination on the basis of disability particularly in employment and public services including education. An education law that provides federal financial resources to State and local education agencies to provide special education and related services to children with disabilities. Anyone with a disability in a program or activity funded by the federal government. 3) be regarded as having such an impairment. Anyone with a disability in a program or activity funded by State and local government. Children ages 3-21 who have been found to have a disability under one of 13 specific disability categories and who require special education accommodation. Dyslexics are protected under the 'specific learning disabilities' category. No funding provided by Federal government but State and local jurisdictions may have to incur costs within existing budgets to ensure that eligible students are not discriminated against. Note that federal funding under IDEA can not be used to accommodate students under Section 504. No funding provided, but some tax credits may be available for organizations facing expenses while making accommodations. Some federal agencies provide support grants for things like training. IDEA receives Federal funding to assist States and local education agencies in meeting requirements under the law. "No otherwise qualified individual with a disability in the United States... shall, solely by reason of her or his disability, be excluded from participation in, be denied the benefits of, or be subjected to discrimination under any program or activity receiving Federal financial assistance"
"any physiological disorder or condition, cosmetic disfigurement, or anatomical loss affecting one or more of the following body systems: neurological, musculoskeletal, special sense organs, respiratory (including speech organs), cardiovascular, reproductive, digestive, genitourinary, hemic and lymphatic, skin, and endocrine." IDEA is unique among U.S. special education laws. Unlike its predecessors that only assured access and prevented discrimination against a student, IDEA is proactive in ensuring that every student with disabilities receive special education services and due process. More importantly, a bar was set in terms of what students with disabilities could expect: Free Appropriate Public Education (FAPE). Federal funding provided under IDEA allows for individual or small group instruction, curriculum or teaching modifications, assistive technology and even physical, occupational, and speech therapy according to the unique needs of your child. Students who previously fell through the cracks, who would not have received the intensive, professional help they needed, can now be helped. Too often it has been dyslexic students falling through those cracks. IDEA is the best line of defense to stop that from happening to your child. Below is a summary of 6 key concepts making IDEA a real watershed in helping dyslexic kids. IDEA Defines 13 disability categories. Dyslexia is included under the Specific Learning Disability heading. Under IDEA, students with disabilities are entitled to be educated in the Least Restrictive Environment possible, meaning that they should be educated in the same classroom and school as all other children to the degree possible. • A statement of the special services and aids to be provided to the child. Be aware that your school may be as much of a barrier to a great IEP as they are a support. Before your IEP meeting check out this helpful list of 'conversation stoppers' and responses prepared by the National Center for Learning Disabilities. Note that this list does not seem to appear on the new NCLD website as of Summer 2015. IDEA provides parents with formal mechanisms for resolving disputes with school boards: Mediation, Due Process Hearing and Resolution Meeting. Mediation involves parents and school district officials meeting along with a neutral mediator who helps both sides come to an acceptable agreement. A Resolution Meeting is a new process allowed under amendments to IDEA made in 2004. The Due Process complaint is discussed prior to the formal hearing in hopes of early resolution. An impartial due process hearing is a formal meeting between parents and the local school district where each side presents its case and a hearing officer decides what the appropriate educational program is, based on requirements in law. IDEA requires all school districts to identify, locate and evaluate all children with disabilities, regardless of the severity of their disabilities even if the school is not providing special education services to the child. Under the law, every state must develop and implement a practical method of determining which children with disabilities are receiving special education and related services and which children are not. In theory this should take pressure off parents for recommending their child for assessment, but don't count on the school to identify your child. If you suspect a problem, ask for an evaluation! Collectively these three laws put a lot of power into the hands of parents with dyslexic children. It's essential that you understand your basic rights under these laws so that you can communicate with your school district from an informed position. If you suspect a disability, request an assessment. If you are not happy with it request an independent educational evaluation, be involved in the IEP process, request accommodations your child needs and if necessary seek mediation or due process, because these aren't just good for you child, they are your rights! If absolutely necessary be sure to seek out a licensed attorney for legal help. 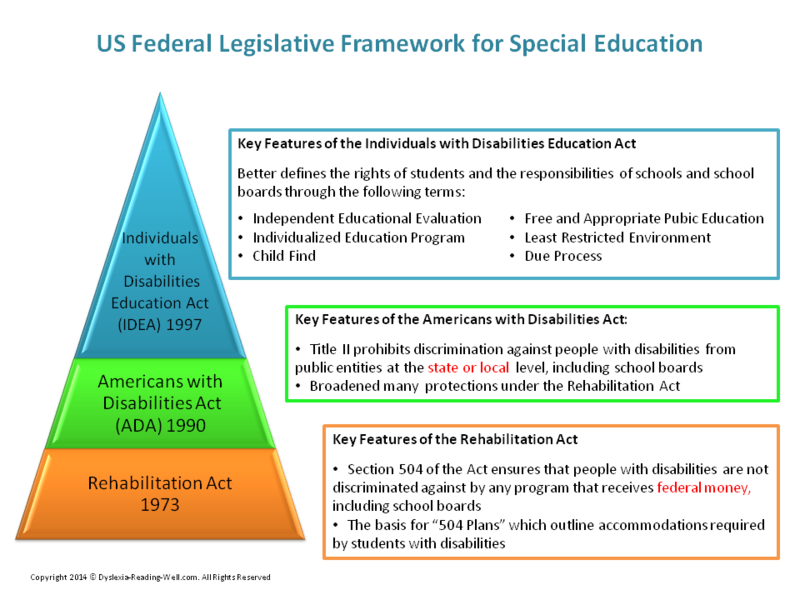 As a Canadian I envy the clear rights, responsibilities and terminology spelled out under U.S. special education law. By comparison Canada has a hodgepodge of provincial laws and regulations to confuse just about everyone. So be sure to take advantage of these hard won privileges to ensure the best possible education for your child!